Only a few weeks after Prisoner actress Wanda Ventham agreed to take questions from Prisoner fans, another Prisoner personality has agreed to share memories of her time working on the series. 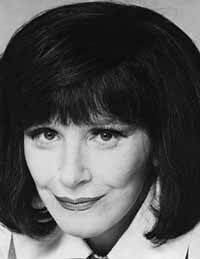 Fenella Fielding, the voice of the cheery Village announcer in the series, has been contacted by Prisoner store PrizBiz and will be happy to answer any questions regarding her long and successful career. Closing date for questions, which should be sent to fenella@priz.biz, is Friday 8th April 2005. Thanks to Catherine Frumerman's Eye on Wales site, some of Ms Fielding's Prisoner memories can be found HERE. Thanks to Roger Goodman, Ceidiog Hughes, and Cathy Frumerman for the above item. Photo: WSC.